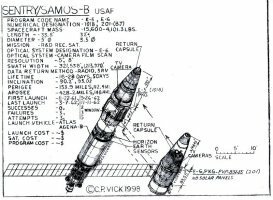 Code name SENTRY/SAMOS-B was the USAF failed attempt at developing an operational film return system. It was hoped that this series of earth orbit USAF, RECSAT, reconnaissance and SIGINT (signals intelligence) spacecraft would be used by the USAF and intelligence Community for primary imaging and SIGINT missions. They were launched by the stretched Atlas Agena-B series of booster launch vehicles with a total of five launches two of which apparently failed in recovery. The first launch of this version of the Atlas Agena-B caring the E-5 high resolution imaging payload, was on April 26, 1962. The last launch on an Atlas Agena-B carrying the Samos-11 with an E-6 high resolution imaging payload was on November 11, 1962. The spacecraft were actually nothing more than USAF services specific earth orbit space based earth imaging spacecraft with a small SIGINT specific mission package. This final SAMOS-B program became the basis on which the LANYARD, KH-6 program was developed. All of the SAMOS payloads imaging efforts were all never very successful. The program was subsequently cancelled in late 1962. The E-4 program was cancelled and replaced by the ARGON, KH-5 mission while the E-3 that E-6 apparently replaced. 1. McDowell, Jonathan, U. S. Reconnaissance Satellites Programs, Part 1: Photoreconnaissance, Quest, Vol. 4, No. 2, Summer, 1995, pp.22-33.